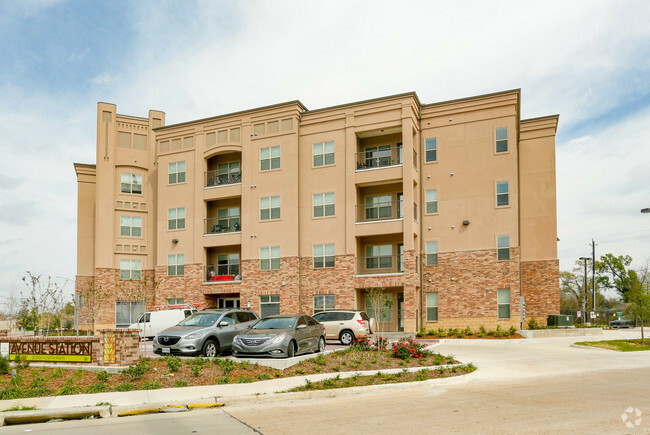 HOUSTON – (By Dale King, Realty News Report) – A newly constructed development of 68 affordable residential units located in a Houston neighborhood designated last year as one of Mayor Sylvester Turner’s five “Complete Communities” is not only complete, it has also been totally leased up. Now that all housing spaces are occupied, the two entities involved in creating the development — Avenue, a local nonprofit devoted to building affordable homes and strengthening communities, and the city of Houston’s Housing & Community Development Department (HCDD) have officially unveiled the project called Avenue Station, an affordably priced complex located in the Near Northside neighborhood at 2010 N. Main St., along Metrorail’s Red Line. “Although Houston was already in the midst of an affordable housing crisis before Hurricane Harvey, the devastating aftermath of the storm – specifically the loss of naturally-occurring affordable housing – further exacerbated the issue,” said Mary Lawler, executive director of Avenue. In Houston’s urban core, the Near Northside neighborhood is home to some 25,000 people, more than one-third of whom live below the poverty line, compared to Houston’s overall poverty rate of 23%. Nearly 40% of residents are housing cost-burdened, spending 35% or more of their income to maintain their living conditions. An increase in development in and around the city’s urban core has escalated housing costs throughout the neighborhood, Lawler noted. As a result, communities like Avenue Station and the city’s proposed Hardy Yards development will help to replenish the stock of affordable residences in the area. Construction of the $13 million project was completed in late 2016, and just shy of 18 months later, it is 100% percent leased. Funding to build Avenue Station came primarily through Round 2 of the General Land Office (GLO) Disaster Recovery funds administered by the city of Houston after Hurricane Ike in 2008, and additional money came from Capital One, Houston Endowment, Local Initiatives Support Corporation (LISC), JP Morgan Chase & Co. and National Equity Fund. The units have floorplans ranging from efficiencies to one-, two- and three-bedroom configurations. Fifty-five rentals – about 81% – are earmarked for low-income tenants making 30%, 50% and 60% of area median income (AMI) while a total of 13 units – roughly 19 percent of the building’s overall inventory – are priced at market rate. Avenue Station is a transit-oriented development offering convenient access to several parks and green areas, including Hogg Park, Woodland Park and Moody Park. It is also close by to several local schools, among them, Ketelsen Elementary, Northside High School, Marshall Middle School and Sherman Elementary School. The Metro North rail line also connects residents to downtown Houston, Hermann Park and Texas Medical Center. Through the development of Avenue Station, the nonprofit has focused on developing safe, healthy, affordable rental homes that improve the quality of life for low-income families. Facilities on site that promote well-being and a sense of community include an athletic court, swimming pool, business center, laundry facilities, computer lab and community clubhouse. Residents at Avenue Station can also participate in supportive services and social programs, such as cooking and nutrition classes, after-school tutoring, art classes, homebuyer education and one-on-one financial counseling. In recent years, Avenue, a HUD-certified agency in business since 1991, has constructed several affordable housing communities in the greater Northside neighborhood, including Fulton Gardens, a 49-unit senior apartment development that is situated along the Metro Rail; Avenue Place, a 95-unit single-family development and Avenue Terrace, a 192-unit multifamily complex. In the neighboring Northline community, Avenue recently announced the arrival of Avenue Meadows, a new 10-unit, single-family development targeted to low and moderate-income families as well as market rate buyers. In addition to affordable living, all multifamily developments offer access to after-school programs and community enrichment opportunities. Avenue also offers comprehensive homebuyer education classes that help first-time homebuyers and other potential purchasers navigate critical aspects of homeownership.